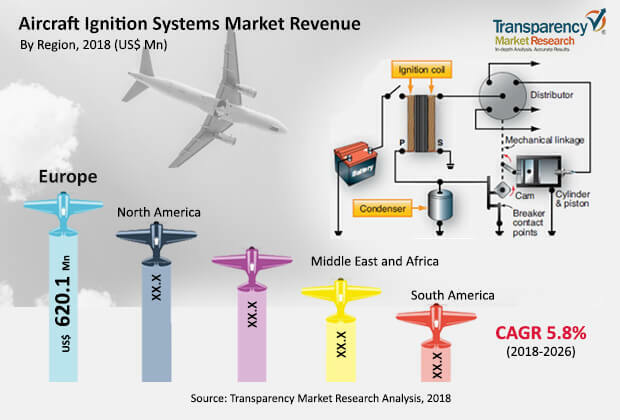 According to a new market report published by Transparency Market Research entitled “Aircraft Ignition System Market–Global Industry Analysis, Size, Share, Growth, Trends, and Forecast, 2018–2026,” the global aircraft ignition system market was valued at US$ 1,862.8Mn in 2017 and is expected to expand at a CAGR of 5.8% from 2018 to 2026, reaching US$ 3,073.6 Mn by the end of the forecast period. This market growth can be attributed to the increasing number of aircraft deliveries across the globe arising out of increase in air traffic. One of the prominent reasons for the growth of the aircraft ignition system market is the spike in the number of aircraft deliveries across the globe. According to the General Aviation Manufacturers Association (GAMA) and Market Outlook Report by Boeing, aircraft deliveries of new airplanes is estimated to grow over 30,000 in the next couple of years. Furthermore, the increasing adoption of advanced technologies in aircraft ignition systems is assisting market growth across the globe. The key trend prevalent in the aircraft ignition system market is the replacement of traditional magneto ignition systems with electronic ignition systems. The traditional magneto ignition systems have enjoyed a greater market share during the last couple of decades. However, aircraft engine requirements are changing rapidly due to the advancements in aircraft technology. The new age electronics ignition systems offer compact form factor and better fuel efficiency in addition to increased reliability and reduced maintenance cost which is leading to its increased adoption. Based on engine type, the market has been segmented into turbine engine and reciprocating engine. In 2017, the turbine engine segment garnered a greater revenue share and is expected to expand at a higher CAGR of 5.8% over the forecast period. This growth can be attributed to the widespread use of turbine engines owing to their high performance and low maintenance cost. Based on components, the market has been divided into igniters, exciters, leads, spark plugs, and others. The exciters segment commanded major revenue share in 2017 due to its high price. This growth can be attributed to the frequent replacements of spark plugs. In terms of global geography, the market has been divided into North America, Europe, Asia Pacific, Middle East & Africa, and South America. In 2017, Europe was the topmost revenue generating region followed by North America. The market in Asia Pacific is expected to grow at the highest CAGR from 2018 to 2026 owing to the increase in air traffic which is eventually leading to increase in the number of aircraft deliveries in the region. Key players in the market are focusing on research and development activities for the introduction of innovative products into the market. This will help them gain a competitive edge and improve brand positioning in the aircraft ignition system market. The key players profiled in the global aircraft ignition system market include Electroair, Generation 3 Ignition, Meggitt PLC, Sky Dynamics Corp., SureFly Partners, LTD., TransDigm Inc. (Champion Aerospace Inc.), Unison LLC, and Woodward, Inc, among others.